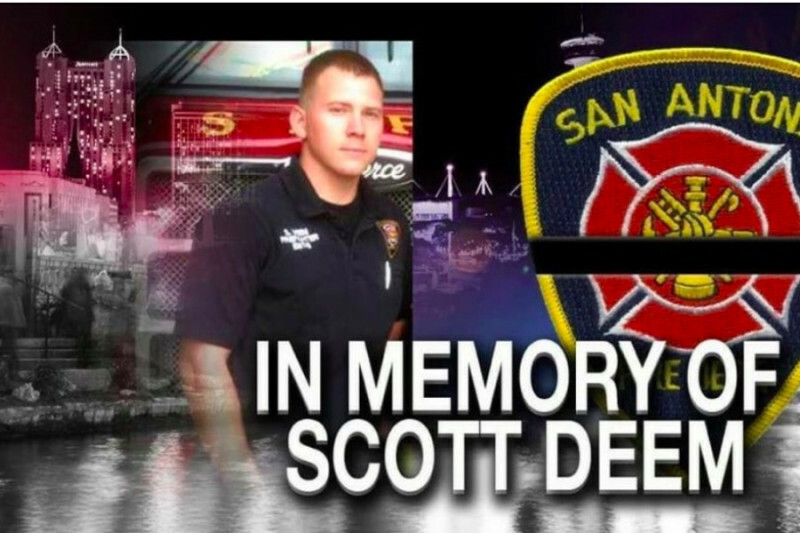 In a time of despair and desperation I am helping the family of the fallen San Antonio Fire Fighter, Scott Deem with this GoFund me account. I am a close friend of the family by way of his nephew Ray Garcia and her sister Jessica Molina. I am told his wife Jenn is very sadden and devastated and is being surrounded by all of her family. Scott leaves behind his wife Jennifer, 13 year old daughter Dakota, 7 year old son Tyler with their 3rd child on the way. Jennifer was a housewife/stay-at-home mom as Scott was the sole provider for his family. The monies will go to help her and her children as they move on with their lives without their husband and father. He loved his wife tremendously and did anything and everything for her and his children. Please help support Scott Deem's family by donating directly to this account which will go directly to his wife Jenn. Thank you all for the countless well wishes, prayers and outpouring of support through the social media outlets and media. Pray for strength as they are so desperatley in need of it. Visitation for Scott Deem will be open to the public tomorrow 5/25/17 from 6pm-9pm @ Porter Loring on McCullough and then at CBC off of Redland & 1604. Procession at 9am starting at Alamodome. Funeral will be private there after. With great gratitude thank you all to the community, SAFD,, the hospitality dinners, fundraisers, church organizations, Starbucks, (Alamo Ranch), Laura (proprietor) Nothing Bundt cakes, Duncan Donuts (Alamo Ranch), FaBooLicious, MADD, family, friends and those who have contributed to the GFM campaign. My apologies if I missed anyone. From the bottom of our hearts thank you. It is difficult and imagine it will only get worse before it gets better. This GoFundMe campaign is for his wife Jennifer, daughter Dakota and son Tyler. I am a close family friend. All accounts were put on hold this past weekend to verify, as there were fake accounts set up. This is a VERIFIED & LEGITIMATE account. Services for Scott will be public and will be announced this week. Funeral services will be private. Please continue to respect their privacy as they continue to grieve for Scott. Thank you to all that have provided financial contribution, prayers, exposure through social media, and hospitality meals for his family. They are appreciative, and grateful for all the love the city has shown. Thank you all for your patience with this account. As some may or may not know there were some accounts set up in Scott Deem's name but were bogus. GoFundMe had to temporarily remove all accounts and verify with the family to confirm which were bad and which were legit. There is only one account for them and this is us. If you feel more comfortable and going to Generations FCU please do so. If you are able to contribute, great!! If not keep praying for the family and please share on your Facebook page. Thank you.